I wonder how many patrons frequent both establishments? Also, do you think there’s a liquor store nearby? Las Vegas is an interesting place, but the surrounding countryside is worth exploring. 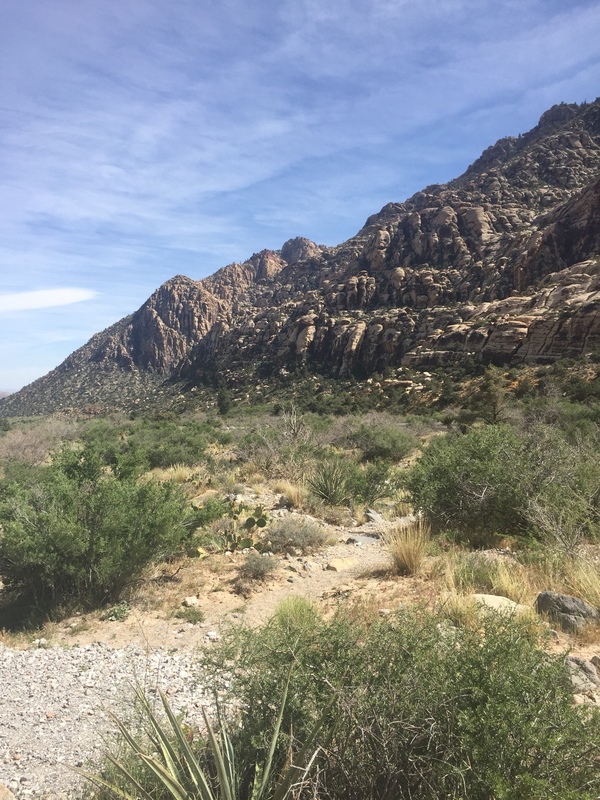 Yesterday, our group ventured about a half hour away from the Strip, out to the Nevada version of Red Rock Canyon — it seems like there’s one of those in just about every western state — for a bike tour with Allison and John, the fine folks at redEbike. First, a word about the basics of the tour. Allison and John really make it easy. Allison picked us up at our hotel and drove us out to the Canyon, John gave us a careful but quick training session on the bikes, and on the tour itself Allison led our pack and John followed to make sure that we stayed together. As a result, there are no issues with getting lost or taking a wrong turn. Second, you don’t need to be a cycling stud to do this tour. The redEbike tours use electric bikes, so you won’t need to be huffing and puffing up the inclines. The bikes have a quiet motor that is triggered by either moving the pedals or a thumb toggle switch on the handlebars, with four speed options. So long as you know how to ride a bike (and we all know that once you’ve mastered that skill, you never really forget it), you can operate the bikes and enjoy the ride. After a little training spin around the parking lot to get the hang of changing the speed setting, we were all ready to go. On the tour itself, I used the pedals rather than the thumb toggle in order to preserve a modicum of self-respect and feel like I’d gotten a decent amount of exercise. The scenery is absolutely stunning. The first stop is a red rock expanse that is used by hikers and rock climbers, pictured above, to show you conclusively that you aren’t in the Midwest anymore, and the rest of the scenery is equally striking. Add in the fresh air, the desert plant life, the feel of sunshine on your back and the wind in your hair, and a few S curves and occasional straightaways where you can let the bike do its thing, and you’ve got a great alternative to neon, smoky casinos, and huge crowds. Is there any downside to this great little excursion? Well, you must don a bicycle helmet and simply accept that, for the entire ride, you’ll look like a hopeless nerd — because that’s what bicycle helmets are designed to do. Thanks to Allison, John, and redEbike for a wonderful, truly memorable experience for our group. If you are out in Vegas and looking for for a break from the norm, I give it five stars. You can learn more about the redEbike electric bike tours here. Amazingly, more than 50 years after the Beatles’ Sergeant Pepper’s Lonely Hearts Club Band was released during the summer of 1967, the iconic photo of the Fab Four from the album towers over the Las Vegas strip. The Cirque du Soleil show Love, which features Beatles music, is one of the most popular shows in town. The Beatles’ music may not prove to be literally timeless, but it has held up pretty well for more than a half century and obviously is still going strong. I can confirm that the sun does in fact set on Las Vegas — and it rises the next morning, too. When I looked out my hotel window this morning I saw dawn’s first rays striking the garish gold Trump hotel across the street, and learned from one of the huge neon signs for the neighboring Wynn hotel that Paul Anka, of all people, is one of their featured acts. Paul Anka! Gold buildings, neon, still-performing figures from the ’60s, dusty desert mountains in the distance . . . I’ve definitely arrived in Las Vegas. On the walk between my hotel and my meetings in Houston this week, there is one of these timed fountains. Maybe it’s because I live in fountain-deprived Columbus, but I find it to be fascinating and beautiful. Not in an overpowering, Las Vegas fountain performance to the sounds of Mannheim Steamroller kind of way, but rather for the simplicity of the arcs traced in the air by the controlled bursts of the water. It makes me wish that Columbus were more like Rome, and that there were more fountains in the world. I’ll take a fountain over a rusting piece of generic abstract art on a corporate plaza any day. The shooting Sunday night in Las Vegas is the worst mass killing in modern American history, with a single gunman killing 59 people and injuring hundreds as he fired shots into a country music festival crowd — but it’s different only in degree, and not really in kind. Accused gunman Stephen Paddock was a little older than the norm, but he was just another lone gunman who was inexplicably motivated to indiscriminately slaughter random people for no readily apparent reason. We’ve heard this story before. Police officials will tell you that there is no viable way to stop “lone wolf” lunatics from launching their deadly attacks if they manage to avoid creating a criminal record, as Paddock did, and that’s the scary thing for the rest of us. Equally scary is the lethal arsenal that Paddock accumulated and then took to his killing room on the 32nd floor of a Las Vegas casino hotel. Paddock had 23 firearms in his hotel room. (Paddock had another 19 firearms, and explosives, at his home.) And while the investigation isn’t concluded yet, indications are that Paddock may have used an automatic weapon and modified other weapons to convert them from semi-automatic to automatic, allowing him to fire more rounds of ammunition in shorter time periods. The devices found in the hotel room also included a stand and a scope that allowed Paddock improve his aim and better carry out his murderous intentions. We may never truly know what set Stephen Paddock on the path to cold-blooded mass murder, and we may never be able to identify and thwart the impulses of other lone wolf killers — but it seems like we should be able to do something about the ability of a single person to amass a trove of automatic and semi-automatic weapons that could kill and injure hundreds of innocent people if that person happens to run off the mental rails. I can understand people wanting a handgun for personal security, and hunters needing a rifle for hunting. But there is a big difference between owning one or two firearms and owning dozens of guns that could be modified to fire dozens of rounds a minute and allow an unknown 64-year-old to turn himself into a ruthless killing machine. We’ve got to figure out a way to prevent this kind of mechanized slaughter in the future. Yesterday legal marijuana sales began in Nevada. Well, why not? In the Silver State there’s already legalized gambling and prostitution, a tradition of Rat Pack boozing and partying, and a prevailing “what happens in Vegas stays in Vegas” ethos. So why not add marijuana to the mix, to ensure that every imaginable mood-altering option is available to people who can pay with the coin of the realm? They don’t call it Sin City for nothing. Nevada now is the fifth state to legalize the sale and possession of marijuana for recreational use. In Nevada, adults 21 and over can purchase and possess up to an ounce of marijuana, but public use is still prohibited — because, even in Las Vegas, you’ve got to draw the line somewhere. Some of the Las Vegas marijuana stores, with names like Reef Dispensaries and Euphoria Wellness, opened at midnight, to take advantage of the first moments that the new law took effect, and reported long lines and brisk business. One purchaser said “you don’t have to hide in the corner anymore and feel bad about it,” and thereby articulated one of the core concepts underlying Las Vegas culture generally. The trend toward general legalization of marijuana seems pretty clear and probably is close to irreversible, but I’ll still be interested in how it all works out for Las Vegas. Drinking seems to go a lot better with gaming than marijuana does. You wouldn’t think that stoned individuals would be particularly keen about going out to gamble, where they probably would wonder whether everyone was staring at them and whether it was their turn to take a hit at the blackjack table. Maybe Nevada is just trying to stimulate sales of Dark Side of the Moon.